Meet all your storage needs with the Honey-Can-Do 60 In. Storage Closet. It provides extra hanging space or seasonal storage. The heavy-duty steel frame construction is very sturdy. It is also resistant to rusting. The high-capacity rod can hold all of your dresses, shirts, pants and jackets. Your clothes stay fresh due to the closet’s breathable fabric cover. It stores your garments and helps protect them from dust and dirt. This double-door storage closet comes with two D-style zippers. The integrated nine-pocket exterior storage is perfect for shoes, slippers and sandals. This storage closet features a lightweight construction and is easily portable. The Rubbermaid Garment Closet is great for seasonal storage, allowing you to stow away winter items such as ski jackets, scarves, heavy sweaters and more. Organize your clothes neatly and efficiently with the Whitmor White 60-inch, Potable Wooden Extra-Wide Clothes Closet. Use this extra-wide clothes closet by Whitmor in your attic, garage, basement or bedroom as either a long or short term storage solution for your hanging garments. This white closet organizer features a breathable fabric cover to keep your clothes fresh and odor-free. It has an easy access zipper as well as a see-through window section at the top which enables you to identify the contents without having to open the unit. The frame is extra strong and can be used for years. 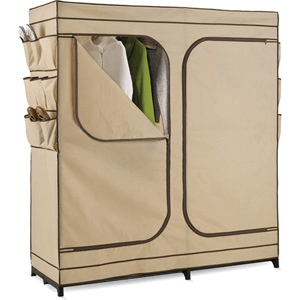 The portable closet storage gives you ample space to store your clothes. Easy to maintain, it can be cleaned with a damp cloth. White 60-Inch, Extra-Wide Clothes Closet: Easy, no-tool assembly Extra strong and durable 60-inch wide frame Breathable fabric cover Easy access zipper See-through window Size: 19.5 In. x 60 In. x 64 In. Tubular steel frame opens to accommodate out-of-season clothes or visiting guests. Attractive poly canvas cover in Grey Color with roll-up door. Assembly. 63-1/2 In.H x 34-1/4 In.W x 18 In.D. Polypropylene Storage Closet with hanging bar and shelf. Easy to assemble. Strong construction. Available in Blue.Size: 46 In. x 20 In. x 69 In. (H) Discount Available For Product and Shipping For Large Orders.